Tilapia with spicy fresh salsa is a healthy person’s dream. Or the busy mom’s dream. Thaw out some low-calorie tilapia, roast it and top it with a spicy pico salsa and it just morphs into a depth of flavor most people couldn’t get in 20 minutes. But you can. You are a flavor ninja. So Jeremy is on Weight Watchers and I am his mastermind. Maybe the evil take-over-the-world kind of mastermind, but I’m all he’s got. I make sure he has exactly enough points in his lunch box to get him through the day and home for dinner. 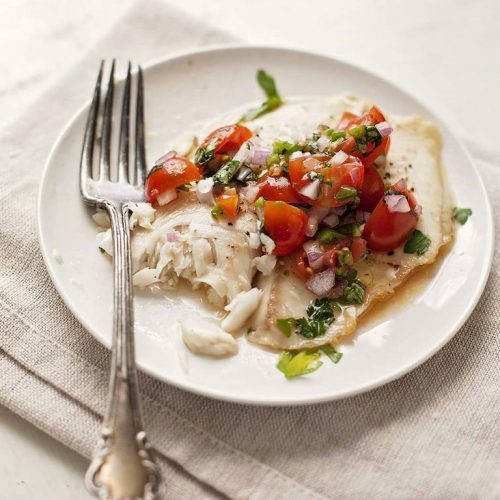 I’m doing my best to make him something he can fill up on without loading up on his points and I love this tilapia with spicy fresh salsa for that reason. Even Logan ate it. And he hates fish. Show him salmon patties and the rants start, so I consider it a pretty good accomplishment that he got this down. Never mind that covering it in a spicy fresh pico pretty much drowns out all the fish–I don’t think that hurt much. If you want less heat in yours, make sure to remove the seeds and ribs (the white insides) from your jalapeño and for heaven sake, don’t touch your eyes. That puts a whole new spin on Johnny Cash’s Ring of Fire. Serve your tilapia with butter parsley egg noodles, wedge salad, or baked mac and cheese. Watching your weight? 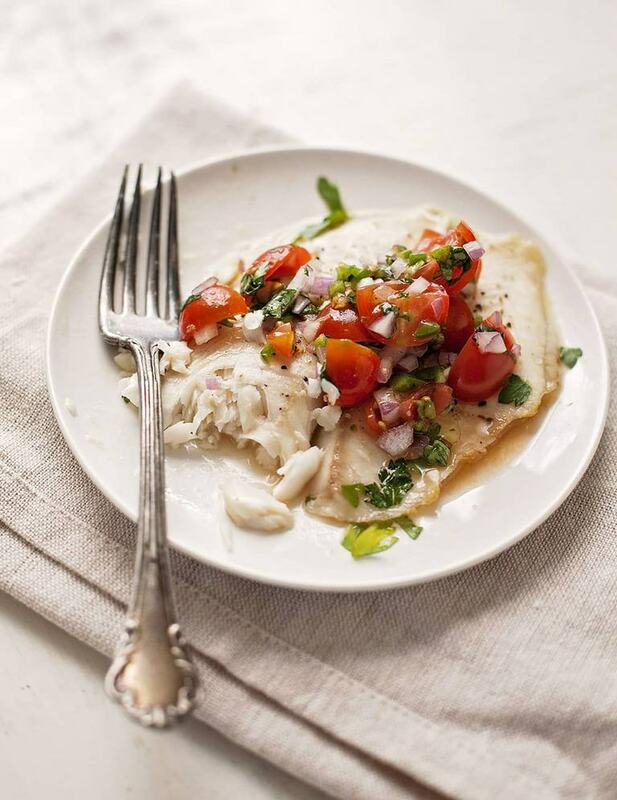 Take it easy on the calories with this tilapia with spicy fresh salsa. A little spice from the jalapeños, and you'll fill up on healthy fats too. Swap the fish for any white, mildly flavored variety you like. Preheat the broiler to high and move the oven rack about 6 inches from the broiler. Line a rimmed baking sheet with foil and spray lightly with cooking spray. Place the tilapia on the baking sheet and pour the olive oil evenly over them. Broil the fish until it flakes with a fork, about 4 minutes per side or so if your fish is thin. Turn it once during cooking. While the fish cooks, toss the tomatoes, jalapeño, onion, lime, cilantro and salt together in a small bowl. Set aside. When the fish comes apart easily, remove from the oven and transfer to plates; top with your desired amount of fresh salsa and serve warm. Made this last night, and it was a hit! This sounds and looks so good. Love tilapia and the salsa topping! Pinned. Thanks for sharing. I’m glad you liked the sound of this Mary! Let me know if you make it and how you like it, okay?